Whether it’s his lack of PowerPoint skills, or his complete inability to grasp even the most basic of technological or aesthetic concepts, no slide or presentation file is safe once he starts to work on it. A plaintive cry of “Sly! What happened to the slides!!? ?” can often be heard echoing from cubical to cubical as coworkers sob into their keyboards, faced with another hopelessly corrupted file or another slide that has metamorphosed from a clean, perfectly formatted gem into a jumbled mess of words, numbers, and graphic chaos that would send Tufte to an early grave. Oh, and Sly also seems to have difficulty putting the right data in the right place when updating slides. The crucial question then becomes, how hard is it to roll back to the previous version of the slide? 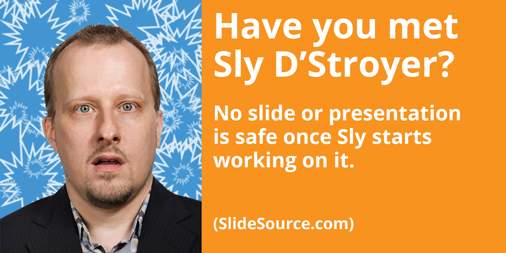 Is it easy for your team to find and repair/replace the slide or slides that Sly wrecked? Is it a worst case scenario where he overwrote the only copy of the file while he was making his “minor improvements?” The answer to these questions determine just how much time and energy Sly has cost the project. SlideSource.com can really help a team quickly get things back to where they should be once Sly has finished making his edits. With its slide-level change history, SlideSource.com preserves every version of every slide as well as all the information necessary to know who did exactly what to each slide as well as exactly when they did it. You can quickly and easily roll back to any previous version if necessary. It’s very possible you may be working with Sly D’Stroyer right now. If that’s the case, please take a few minutes to visit SlideSource.com, sign up for a free, full-featured trial account, and see how it can keep your team’s destroyer from sinking your project.